If the opening in the diaphragm is too big, then a part of the stomach can slip above the diaphragm and this is called a hiatus hernia (also called hiatal hernia). 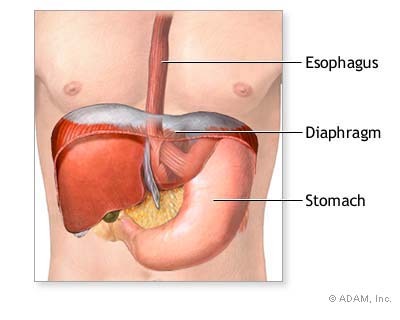 Normally the stomach is located underneath the diaphragm, which separates the abdominal cavity from the lung cavities. We do not know whether it is from blunt trauma to the abdomen or whether it is congenital. But we know from X-ray studies that about 40% of people have a hiatus hernia (sliding type) and most do not know this as they have no symptoms. As long as the gastroesophageal sphincter is working like a valve, the hiatal hernia will be asymptomatic. However,as the muscle fibers of the diaphragm normally wrap around the lower esophagus as well and thereby reinforce the function of this valve, it is easily understandable that in time a certain percentage of people with a hiatus hernia will eventually develop acid reflux into the lower esophagus. Those patients who are symptomatic will have chest pain, sometimes indistinguishable from a heart attack. 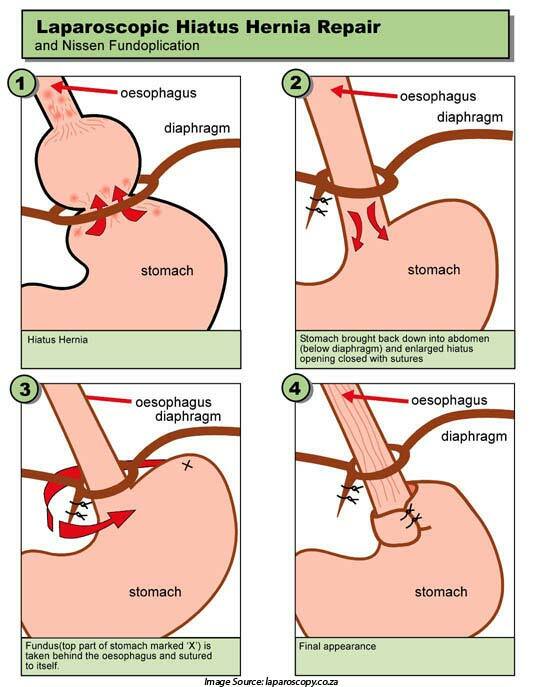 In a patient with a so called paraesophageal hiatus hernia, where the gastroesophageal sphincter is in the normal location but a part of the stomach is adjacent to the esophagus above the diaphragm, may suddenly become highly symptomatic. A certain percentage of these patients unfortunately develop an incarcerated hernia, where the stomach that’s above the diaphragm gets stuck, swollen and then strangulates as the blood vessels get obliterated from the pressure. The patient now has excruciating pain in the upper mid abdomen, also irradiating into the chest. If the esophagus starts bleeding, there might be vomiting of blood and if this happened more slowly over a period of time there might be black stools (melena stools) from digested blood. 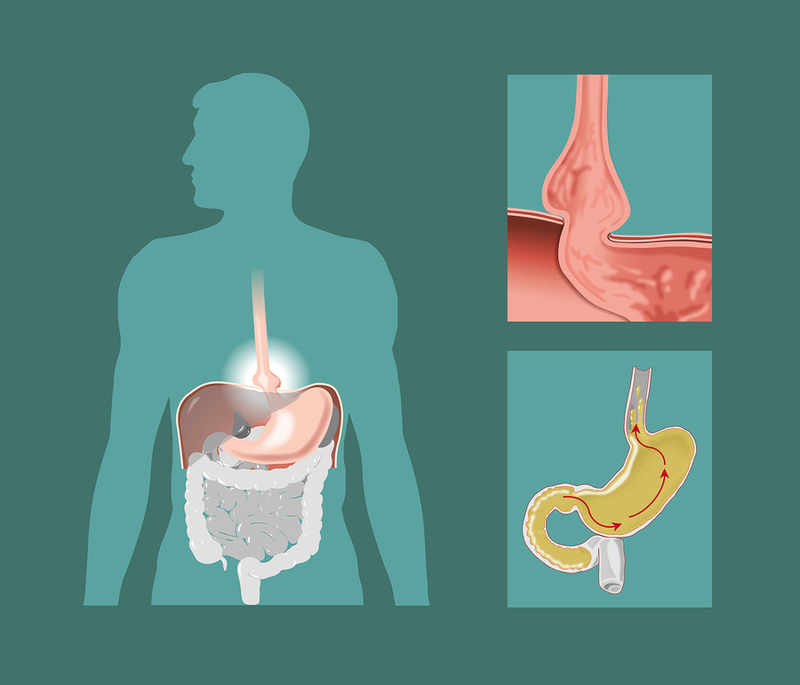 The moment the paraesophageal hernia is incarcerated, it is a surgical emergency, as there is a danger that the stomach ruptures and stomach contents pour into the abdominal cavity leading to even a worse scenario, acute peritonitis. Any of these symptoms should prompt the person affected or a family member or friend to call 9-1-1 to get an ambulance and transport the patient to the nearest hospital. In the last scenario the surgeon likely will have to repair the hernia under a general anesthetic. Otherwise it is very rare that a hiatal hernia would have to be repaired surgically. 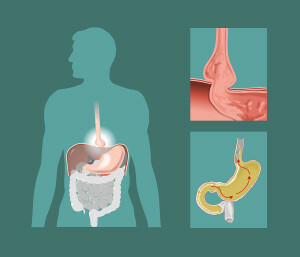 Nowadays it is much more likely that either an H2 blocker or a proton pump inhibitor will control the problem of reflux and most of the hiatal hernias do not need surgical treatment.